Stay tuned for additional details about Mistletoe & Magic 2019. If you have applied and/or participated in Mistletoe and Magic in previous years, you will use the same login and password that you created when you first applied. Please do NOT recreate a new account if you have applied in past years. If you have forgotten your log-in or password please click here for assistance. Log in to your Merchant Corner page to access our 2019 application. To do this, click on “Members” at the top right section of the screen. Once in your Merchant Corner, click on on the link “Apply to be a merchant.” Be sure to hit the submit button at the bottom when you’re finished. If you do not see the application link in your Merchant Corner email merchantchair@juniorleagueoftyler.org to inquire about available booth space. Print and fill out the sample and photo submission form and mail it in. This is located under Merchant Resources on the Mistletoe and Magic area of the website and also within your Merchant Corner. If you choose to send photos via e-mail, you may e-mail them to merchantchair@juniorleagueoftyler.org. Without photos and/or samples, your application will be considered incomplete. 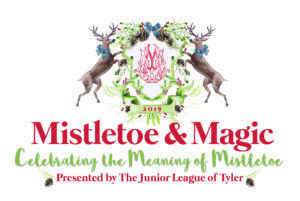 The Junior League of Tyler, Inc. and the 2019 Mistletoe & Magic committee are excited to begin the merchant selection process for this year’s show. Our unique shopping experience will be located at Harvey Convention Center in Tyler, Texas. The membership and committee will host the 41st annual Mistletoe & Magic Wednesday, December 4th through Saturday December 7th. The Mistletoe & Magic Merchant Committee will review all merchant applications. Below are factors that are considered for selection. Quality and type of product in each category (jewelry, food, clothing, etc.) and price points. Presentation of merchandise submitted (current merchandise photos, previous booth photos and samples are required with application). Each merchant should provide a unique shopping experience – as if you were walking into a specialty shop. Promptness in returning ALL completed information. Rotation of previous participants with new merchants in the same category. If you are interested in participating in Mistletoe & Magic 2019, please follow the instructions at the bottom of this page. All applications will be presented to the Merchant Committee. Mistletoe & Magic reserves the right to limit the amount of similar merchandise. If accepted to the show, only items listed on your application will be allowed. Changes must be requested in writing to the Merchant Chairman. Subleasing of merchandise on consignment will not be allowed unless requested in writing and approved by the Merchant Committee. We reserve the right to accept all or part of your merchandise. Previous participation in Mistletoe & Magic does not guarantee selection. Booth size and location is determined at the discretion of the Merchant Committee and on a first-come, first-served basis. You will be advised of your booth size and location within your contract. The Junior League of Tyler receives NO percentage from merchant booth sales. If you’re a new prospective merchant, you must first create a profile before you will be allowed to complete the 2019 Merchant Application. Please submit a request for a merchant profile by clicking here. Once you receive an email that your profile has been approved (within 2-3 days), you must visit our website, click the tab “member login” and login to the Merchant Corner area of the site. Click on the link “Apply to be a merchant” and fill out all of the information required. Be sure to hit the submit button at the bottom! If you do not see the application link in your Merchant Corner email merchantchair@juniorleagueoftyler.org to inquire about available booth space. Print and fill out the sample and photo submission form and mail it in. If you choose to send photos via e-mail, you may e-mail them to merchantchair@juniorleagueoftyler.org. Without photos and/or samples, your application will be considered incomplete.